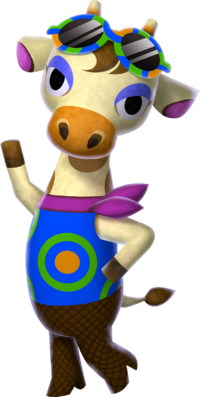 Gracie is a reoccurring giraffe character in the Animal Crossing series that works as a high end fashion designer. In Animal Crossing: New Leaf, Gracie is named “Grace” in the Japanese version and is identified as male by the official Japanese website. Grace’s Japanese profile further notes “Oh, and just so you know, Grace is a he!” in the description. However, in the English localization of the game, similar to Saharah, Gracie is a female character with no mention of male pronouns or a more masculine name. Some fans have read this to mean that she is either a transgender woman in non-Japanese titles or a very feminine gay man in the Japanese release.